iPhone 7: Our staff predictions -- and a Bingo card! Apple’s annual iPhone event is mere hours away, but the rumor mill has, true to form, been churning busily away for months. So there’s no shortage of information, spurious or otherwise, about the forthcoming announcements from San Francisco. And Apple has been a bit more predictable in recent years, hasn’t it? There’s going to be at least one uplifting video presentation with aspirational music playing in the background, CEO Tim Cook is going to use words like “magical” and “journey” a lot, and he’ll show us some cool new iPhones. Given this relative predictability, a few of us here at Network World have decided to put our money where our mouths are. 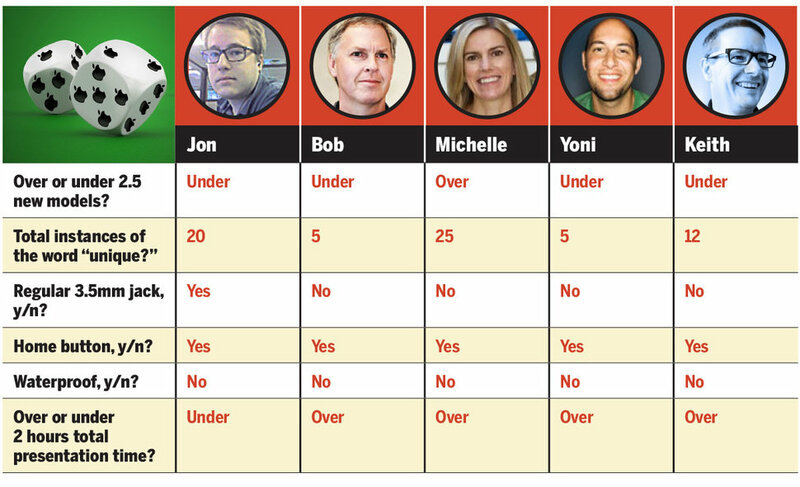 Here are predictions from community editor Michelle Davidson, online executive news editor Bob Brown, blogger and Apple expert Yoni Heisler, video raconteur and editor Keith Shaw and myself, senior writer Jon Gold. We’ll update this post after the event, to see which of us had the best answers. But if you need a little bit of side entertainment during the Apple event yourself, we’ve even got you a bingo card that you can use to follow along as Tim and friends take us on a magical journey of innovation and delight. Download it here. We’ll have full coverage right here on Network World, so check with us before, during and after the event for wraps, analysis and more.